Since joining MRN in 2006, Chris has become a highly regarded and trusted member of the team. Chris has had a great input into developing the business further. It was his determination that drove MRN to become regulated by the SRA. He was the first to receive a training contract at MRN, and in 2012 became the first Solicitor to qualify at MRN. Beyond this, Chris was also part of the team that created MRN’s unique Client Management System and bespoke Billing programme which both help to achieve consistency and a better client experience. In 2013, Chris left MRN to become a Costs Team Manager in the Serious Injury team at a large national law firm. During his time there he worked on many high value claims such as complex road traffic accidents involving issues of permanent disability, capacity, case managers and provisional damages. Chris returned to MRN in 2015, being drawn back to its genuinely hard working team and ambition to provide quality over quantity for its clients. 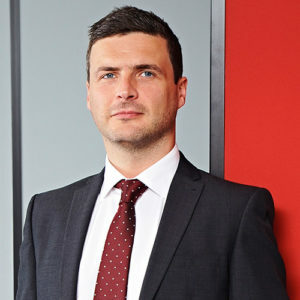 Despite a vast experience in all areas, Chris predominantly deals with high value and complex matters of Clinical Negligence and Commercial Litigation working to prepare Costs Budgets, Bills of Costs and Schedules. He is adamant about achieving the best results for his clients that reflect their effort and will therefore follow his case through to Hearings when necessary. Chris is motivated by the fight of defending his client’s position by creating powerful technical arguments. He got into law to help people and enjoys assisting his clients to recover the money they deserve. Having worked in-house, Chris is able to sincerely help his clients understand the process of costs and its necessity for their business. With his rich history in legal costs, Chris has a lengthy list of notable cases. In a high value and intricate clinical negligence matter, Chris was able to achieve approval of 90% of his budget after attending a CCMC in the Royal Courts of Justice in London. The claim involved an alleged negligent overdose of morphine leading to the death of a baby, which the Defendant attempted to conceal and then released the body to the Claimant instead of the coroner. The police were then sent to recover the body from the funeral to allow for an inquest. The damages in this matter were valued at over £1.3 million and also involved human rights issues. Furthermore, in a recent matter, Chris was successful in attaining an interim payment from the Defendant following a strong argument in reference to the operation of CPR 44.2(8). The Defendant used a County Court judgment extract to object to the request within a Part 8 Claim form for an order of interim costs. Chris provided the Court with a full copy of the judgment, which was made by the Regional Costs Judge in that same Court, and objected to the Defendant’s conduct as their argument was flawed and the cited judgment actually supported the Claimant’s argument. The Court then made an order for the interim payment. Chris’ proudest costs accomplishment was the preparation of a highly complex and substantial Commercial Litigation claim involving 138 claimants with related causes of action against three defendants. The matter involved a newly built estate in the North East that was marketed as professional housing, but the houses quickly fell apart with many sinking and floorboards rising. The houses had to be remediated, including new foundations, and the claimants received damages for inconvenience, expenses, and for diminution in value due to the media surrounding the case. The total costs claimed for this matter were in excess of £10 million and over 80% was recovered. Outside of the office, Chris is an avid traveller, taking any opportunity to see the world! He enjoys Italian cities and Greek beaches. Chris also enjoys music and regularly attends concerts. His musical tastes vary from symphony orchestra performance of Beethoven to recently seeing Red Hot Chili Peppers for the sixth time. His greatest personal accomplishment was performing at Manchester Academy with his band, Fixxxer. He has seen many of his favourite bands play at Manchester Academy and during their England tour he got to play on that same stage.